I am hoping to start sharing my weekly “mummy meditation” thoughts here on the blog. I will summarise what God has been revealing to me in the previous week through my meditation on the verse, and then I will let you know what verse I am going to be looking at over the coming week so you can join me in thinking, studying and discussing it over the week. 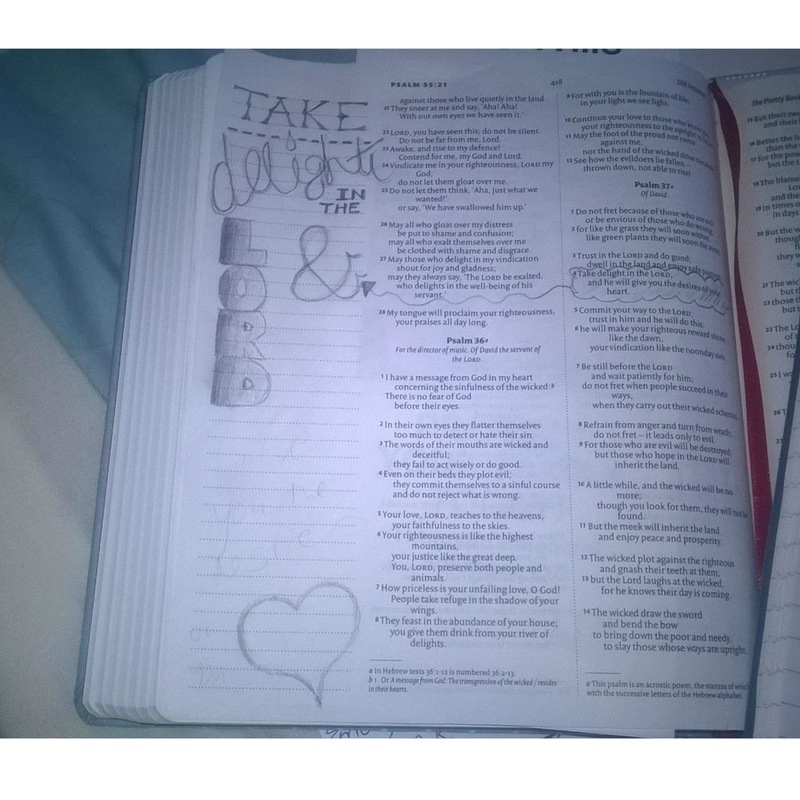 I might also be sharing some pictures of any bible journaling that I do in response to the verse too, so if you are joining me on starting off bible journaling you might enjoy following this too! I think the thing that has really been jumping out to me over the last few weeks has been this word DELIGHT. 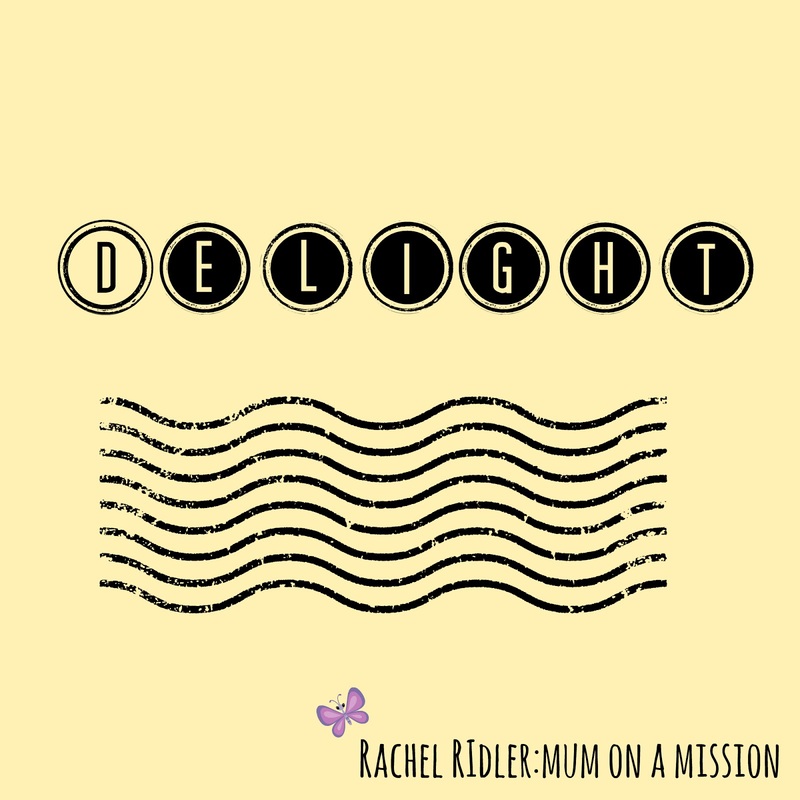 What does it really mean to “delight” in the Lord? Delight is defined as “great pleasure or joy” and “to take great pleasure and enjoyment in”. I love the thought that I would be in that place in my relationship with God -that all the time I spend with him and everytime I think about him or talk to him it fills me with great pleasure and joy! I know I am not always in that place, but I really really want to be. I mean, look at the things that these verses say are promised to those who do this – they will be given the desires of their heart and they will not fall. How amazing is that! Another thing that kept coming back to my mind was that God allows us to stumble, but he doesn’t allow us to fall. Now what, you might ask, is the difference here? I think stumbling is what happens to us all in life – circumstances come upon us and sometimes they knock us for six. It might be a death, a job loss, an emergency of some kind. God doesn’t stop life happening to us, and he knows that sometimes it is going to affect us and cause us to stumble a little bit. But the important thing is that when you delight in the Lord (not just kind of like him, not just occasionally say hi when you remember he is there, but truly DELIGHT in spending time with him and get great enjoyment from being around him) he will not let that be a permanent situation. He will pick you back up, dust you off and help you start walking again. That is the amazing God that we have. And does he let someone else do that for him? NO WAY! He is right in their with his own, personal hand to pick us up because that is how much he cares. WOW. It is all pencil drawing, which I was planning to colour in later once I had got all the design finished. Why not join the conversation throughout the week at my new facebook page. I'd love to join you in this. Great idea. Writing out the verse for next week right now.